The Smithsonian Blog for the Smithsonian National Museum of American History has an excellent run-down of Girl Scout memorabilia titled, "Collecting a century of Girl Scouts". 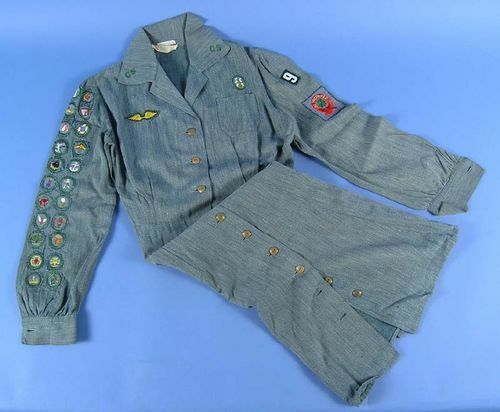 Among items provided to The Smithsonian through the Girl Scout’s National Historic Preservation Center, is a uniform sash that belonged to Louise Davis (later Louise Davis Jones). Louise was born in Goldsboro, North Carolina in 1914. According to her children, she loved the outdoors from an early age, so it was not surprising that she became an enthusiastic Girl Scout and an adult troop leader. As a member of Goldsboro’s Troop #2, her dedication earned her the highest Girl Scout award of her day – the Golden Eaglet. Definitely look here for more.